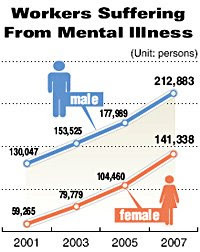 With the business world becoming ever more complex and competitive, more people are suffering from various mental illnesses due to work-related stress, government data showed Wednesday. "The key reason to mental disease is stress. Workers should always try to effectively control their workload and tell themselves not to rush,'' Psychiatrist Kang Hee-chan said. It was mostly the workload or the work itself giving stress to males. They said they couldn't bear the stress of having to stay late at work or not being able to go home; or dealing with large amounts of hard work. They mostly had "insecurity'' issues. Men in their 30-50s were the most common sufferers. About 3.7 percent of those in their 40s and 50s had such symptoms. On the other hand, women couldn't stand the stress of conflict and tension caused by relations in the office. Yang said she has been taking medicine for the past two months. Another worker at a perfume manufacturer said she has been in therapy for over a year. "I am rather a quiet person. But office life was all about being vibrant and having to laugh all day with people. It took me a year to assure myself that I could be friends with my teammates,'' she confessed.